Let me start this post off with a quick programming note. As I referred to on Twitter the other day (are you following Chasing Amazing on Twitter? Yes? Great. No? What’s wrong with you), I’ve hit a point of overload with a lot of these Spider Island tie-ins, so beyond the three remaining ASM issues that tie into the story, Herc #8 will be the last Spider Island tie-in I wax poetic about. Actually, considering the only two issues left uncovered by me are Black Panther #524 and Heroes for Hire one-shot, I think I did pretty good, going a bit beyond my comfort zone and writing about characters and creative teams who are typically in my comic book blind spot, since I’m a fairly myopic Spidey guy. However, despite there only being two issues left, I’m also not going to force posts, because I have really nothing worthwhile to say. 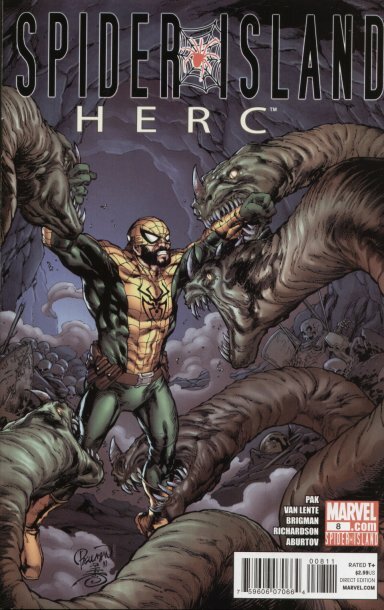 If you really want to know my thoughts on those two issues, I’ll just say as a non-Black Panther person I was completely lost as to why there was any kind of tie-in here, and the Heroes for Hire one-shot came across as a cynical attempt by Marvel to try and leech some of Spidey’s heat for a far-less popular comic book series. Meanwhile, considering I had never read a Herc comic before in my life, I found myself strangely enthralled by issue #7, the title’s first Spider Island tie-in. What ultimately sucked me in was the fact that it was one of the only SI issues to explore what it emotionally means to be Spider-Man from the perspective of a total outsider. I thought Herc’s “with great power comes great angst” allusion to the classic line, was just a terrific bit of camp, that found a way to capture 50 years of Spidey’s spirit in one thought bubble. What was disappointing about issue #8 was how the comic read as if it thematically jumped into a totally different direction from its predecessor – obviously tying in the usual elements we’re seeing in these Spider Island crossovers (NYC in chaos, humans getting spider powers and then turning into mutated spiders, etc.) – but then totally ignoring the actual emotional elements that make Spider-Man such a fascinating read all these years later. In other words, I wanted to read more about “power and angst” and instead got an irreverent little Herc tale filled with X-Men and demigod to God copulation. Okay then, I guess that has some entertainment value, but the series went from a really interesting tie-in to the main title to more frivolous crossover fodder from Marvel in the span of one issue. I think what pushed me over the edge with this issue was how Herc’s entire situation was resolved. Spider-Man has generally come across as a rather “Godless” title in the past, and without having this conversation devolve into something about religion and faith, I prefer that. Spider-Man, at its core, is a story about a man’s destiny and his ability to cooperate with his destiny or fight it at the risk of endangering himself or others. Once he’s bitten by a spider, being Spider-Man is no longer a choice for Peter Parker, but he does have a choice as to how he’ll use his powers – for good or for selfish-reasons. Readers are frequently reminded what has happened when Peter chooses the selfish route. However, we always understand that he is fully in control of his decisions. When someone tragic happens in his life, it’s usually directly connected to one of Peter’s earlier actions. The idea that some kind of higher power is playing games with Peter, never enters into the picture. Which is why I was so disappointed when Herc was engaged in battle with the X-Men, under direct control from the Spider Island Queen (a character, despite the “deep-cut-ness” of her, I’m really not entirely impressed with as the SI mastermind, but I guess that’s a post for another day) and what ultimately changes the outcome was legitimate divine intervention from Arachne. While that’s a seemingly true-to-form editorial decision for a comic book based on a Greek mythology, as someone who routinely reads about a character who has to personally deal with the fallout from his decisions, the Arachne ending left me totally flat, regardless of the humor being injected into it.